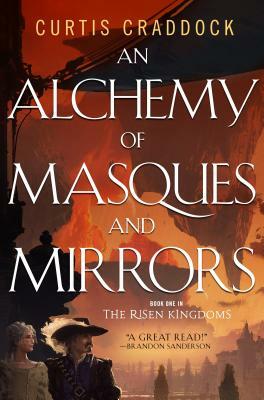 An Alchemy of Masques and Mirrors is Curtis Craddock's delightful and engrossing fantasy debut featuring a genius heroine and her guardian, a royal musketeer, which Brandon Sanderson calls, "A great read!" Born with a physical disability, no magical talent, and a precocious intellect, Princess Isabelle des Zephyrs has lived her life being underestimated by her family and her kingdom. The only person who appreciates her true self is Jean-Claude, the fatherly musketeer who had guarded her since birth. All shall change, however, when an unlikely marriage proposal is offered, to the second son of a dying king in an empire collapsing into civil war. But the last two women betrothed to this prince were murdered, and a sorcerer-assassin is bent on making Isabelle the third. Isabelle and Jean-Claude plunge into a great maze of prophecy, intrigue, and betrayal, where everyone wears masks of glamour and lies. Step by dangerous step, Isabelle must unravel the lies of her enemies and discovers a truth more perilous than any deception. Curtis Craddock lives in Sterling, CO where he teaches English to inmates in a state penitentiary. An Alchemy of Masques and Mirrors is his first book.